This past weekend was an eventful one with gorgeous weather, exciting people and most delicious food. All in one place – my native town of Detva and its close vicinity. The end of May usually brings more sunshine, higher temperatures and a whole lot of outdoor activities. Whether it be walking tours organised by local branches of Slovak Hiking Club, open-air goulash parties in the country, or traditional Maypole dancing, they are all splendid events that deserve a special mention. Before I start blogging about these, I want to put down a few notes to help me remember my culinary experience in the bakery ‘U Boriakov’. It’s where my journey began last weekend. To be more precise, I’d had to arrive in Detva the evening before in order to be at the place early Friday morning. The ‘U Boriakov’ bakery is a family business that has been up and running for over twenty years now, but the real breakthrough came when they launched the traditional Detvian strudel production a few years ago. When I showed up at eight on Friday morning, the bakers had already had a few batches of the strudel ready and cooling down in the storeroom. The staff of seven had been working since six – the father and mother both at retirement age yet still active, a son and three daughters plus a friend from the neighbourhood. It was clear they all knew their place in the house-turn-small-factory. A large kitchen that took up most of the ground floor was equipped with two sizeable ovens, which sent an irresistible smell all over the place. I tried hard to focus on the people and the photography to diverse my thoughts from the strudels, but it proved a lost battle. Against my normal routine I hadn’t had breakfast that morning, and my stomach was not at all happy with ‘digital food’. Fortunately, I was saved a few moments later when the bakers decided to have their morning coffee break. The family invited me for a nice cup of tea, which came with a plate full of heavenly strudel and a good-natured conversation. All my senses were utterly pleased, and my stomach more than satisfied. It was much easier afterwards to follow the baking process, ask the right questions, and admire the bakers’ inimitable dexterity. They used to knead the dough by hand, but with the demand for the strudels rocketing, the father decided to turn to a machine. He buys all the ingredients and is responsible for the dough preparation. It’s essential to lay the dough out onto a large, floured cotton sheet, which is used for shaping the strudel at a later stage. The dough has to be rolled out evenly to ensure the right shape of the strudel. Probably the most important stage to determine the strudel’s appearance. The dough needs to be pulled out by hand into a paper-thin sheet. Although the ground poppy seed strudel is by far the most popular, they also do other fillings like nuts, apples, curds as well as combinations of these, which are often enriched with cherries or other seasonal fruit. There’s a special filling for the wedding strudel that is in great demand too. In the final stage of strudel making, the bakers lift the large cotton sheet the dough has rested so far, and they roll it in by pulling and moving the sheet simultaneously. 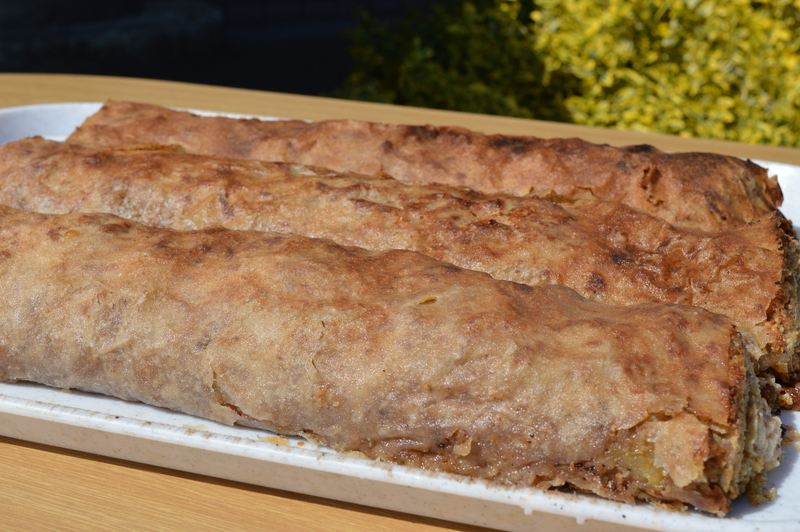 The long strudel is then divided into equal parts by a special measuring device designed and made by the father. After that, the strudels are transferred onto a baking tray, brushed with melted butter all over their tops, and baked. Mouth-watering, isn’t it? Well, it’s no surprise that Detvian Strudel got a ‘Regional Product of Podpolanie’ award for the second consecutive year. It’s a highly respected label that honours quality, traditional production and the use of local labour, as well as regional resources and ingredients. If you want to experience the strudel making yourself, just send me a message and I’ll try to arrange a visit for you.